These quilts are from our book, Quilts With A Spin, which is out of print. Click here to buy it directly from C&T Publishing as a print-on-demand book. Pennsylvania Pickle Dish from the book Quilts With A Spin by Becky Goldsmith & Linda Jenkins. Quilt by Linda Jenkins. Everyday Best, below, is available as an individual epattern. Click here for more information. Everyday Best from the book Quilts With A Spin by Becky Goldsmith & Linda Jenkins. Quilt by Becky Goldsmith. Empress FEathers from the book Quilts With A Spin by Becky Goldsmith & Linda Jenkins. Quilt by Becky Goldsmith. 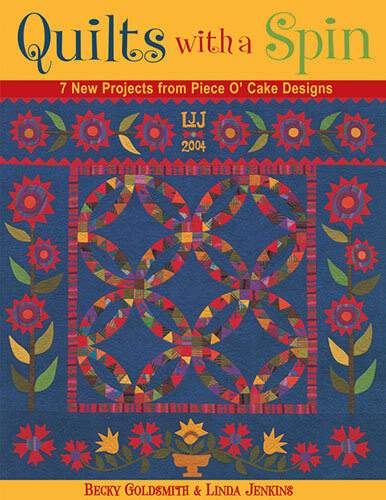 Addicted To Dishes from the book Quilts With A Spin by Becky Goldsmith & Linda Jenkins. Quilt by Becky Goldsmith. Dresden Dots from the book Quilts With A Spin by Becky Goldsmith & Linda Jenkins. Quilt by Linda Jenkins, quilted by Mary Covey. Whirlygig from the book Quilts With A Spin by Becky Goldsmith & Linda Jenkins. Quilt by Becky Goldsmith. Whig’s Defeat from the book Quilts With A Spin by Becky Goldsmith & Linda Jenkins. Quilt by Linda Jenkins, quilted by Linda V. Taylor. Fantastic quilts, I love the bright colors. They would pop in any setting, especially during these cold wet winters. Thanks for sharing.